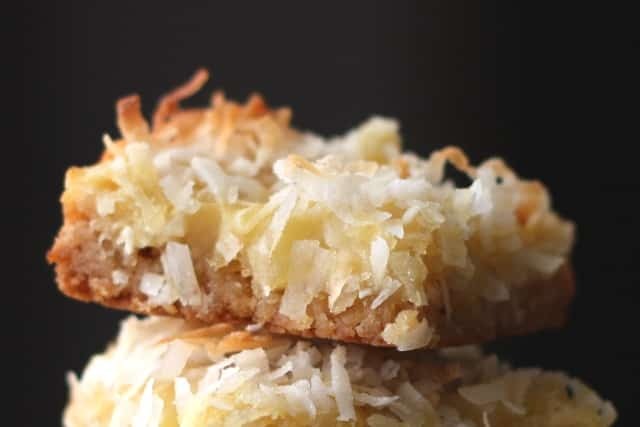 A crisp shortbread crust is topped with a chewy gooey layer of pineapple and coconut to make these Pineapple Coconut Bars. With a deep love of all things pineapple, I’ve been playing with the idea for Pineapple Bars for a while now. Not too sweet and slightly tart, these bars are a fruity tropical drink in bar cookie form. I liked these bars so much that I am making them again this weekend for a family barbecue and I’ll be posting a gluten-free version next week as well. When Dole asked me to create a pineapple recipe with their pineapple, my reply might have been the fastest yes I’ve ever typed. I’ve been partial to Dole ever since I started buying my own groceries. Canned, fresh or frozen, I love pineapple in all forms. I didn’t even need to go to the store for the pineapple in this recipe. I had several cans ready to use, waiting in my pantry. I have been on quite the pineapple kick lately, from crepes to salsa to stir-fry recipes; I can’t get enough of the sweet kick that pineapple adds to almost any recipe. One of the reasons Dole pineapple is my favorite pineapple is because the slices, chunks, and tidbits hold their shape very well. There are never soggy or wilted pieces of fruit in the can. Canned and frozen fruits are an easy way to get healthy fruits for your family, especially when your favorite fruits are out of season. I also love how easy it is to just pull a bag out of the freezer or open a can and immediately get to enjoy the juicy sweet pineapple flavor I crave. As much as I enjoy fresh pineapple, sometimes I just don’t have the time or energy to mess with the cutting and slicing. I keep pineapple on hand year-round to add a sweet, tropical flavor to meals, snacks, and desserts. If you’re interested, you can checkout all the pineapple recipes on my blog here. Coconut and pineapple are a match made in tropical heaven. Whenever I can find a way to incorporate pineapple into coconut recipes and coconut into pineapple recipes, I go for it. 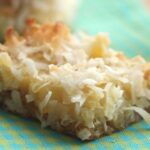 The texture of shredded sweetened coconut in these Pineapple Coconut Bars is off the charts delicious. 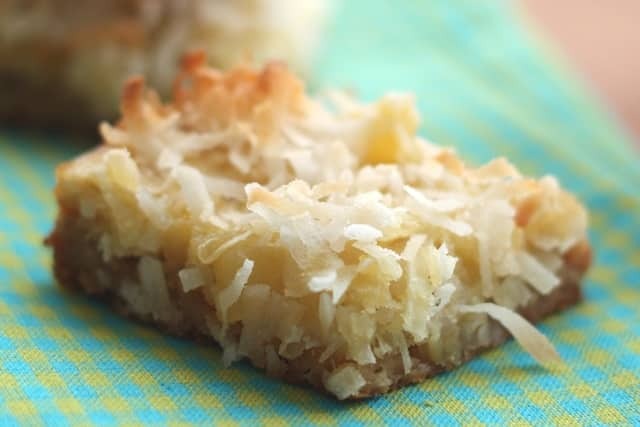 The coconut adds a slight crunch to the smooth pineapple filling and looks pretty to boot. I also love coconut sans pineapple and have had fun experimenting with different ways of using it in my baked goods, from Coconut Scone Cookies to Grandma’s Coconut Chews, I’ve never met a coconut recipe I didn’t like. 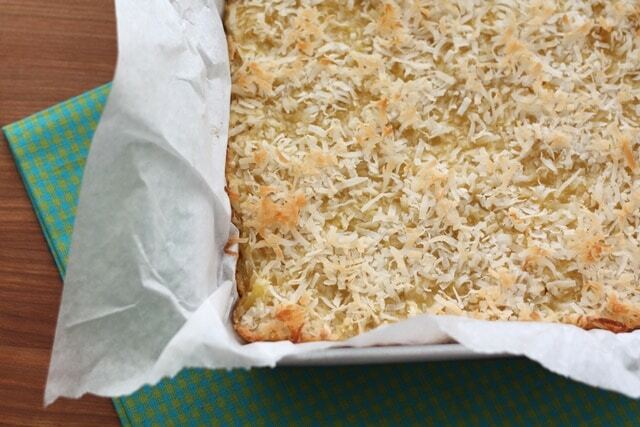 Next on my list to try is these Gooey Coconut Bars from Crazy for Crust. At the moment, these Pineapple Coconut Bars are all I need when it comes to fruity and tropical desserts. They’re also super easy to assemble and take less than an hour in the oven. 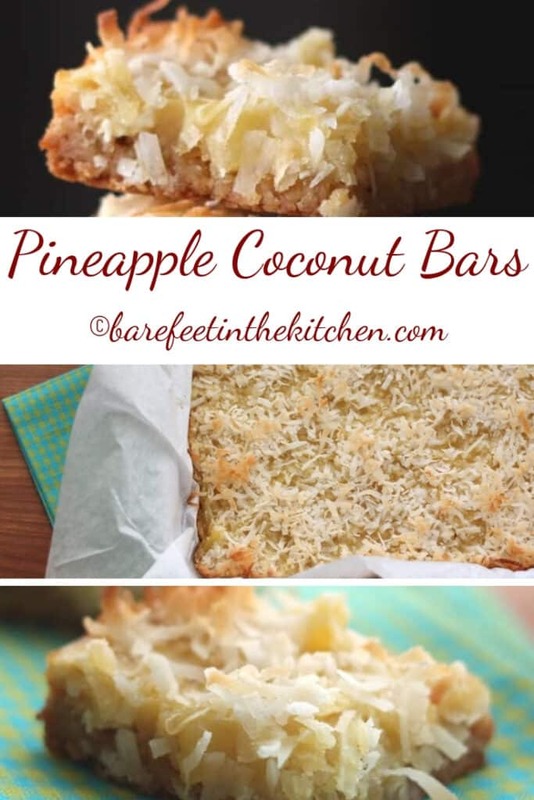 Perfect for parties, potlucks and afternoon snacks, everyone loves biting into these perfect pineapple coconut dessert bars. I mentioned before that they remind me of a fancy tropical drink (ala the Pineapple Coconut Sour cocktail) but in food form. If that isn’t enough of a motivation to try these bars, I don’t know what is! The flavors remind me a little of Pineapple Upside Down Cake but with a crisp, buttery crust and the perfect amount of coconut. If that sounds like your cup of tea, grab your pineapple and your shredded coconut and get baking. Preheat the oven to 350 degrees. Combine the crust ingredients and press the mixture into the bottom of a well-greased or parchment lined 10” square pan. Doubling this recipe will fill a 9×13 pan. Bake for 12 minutes (or 15 minutes for a doubled recipe). Remove from the oven and let the crust cool for 10 minutes while preparing the filling. Place the pineapple and 1 cup of shredded coconut in a bowl. Sprinkle with flour, brown sugar and salt. Stir to coat. Mix together the eggs, vanilla and lime and stir into the pineapple mixture. If you would like to double this recipe, it will fill a standard 9×13 pan. You can make this recipe in an 8, 9 or 10-inch square pan. Simply increase the cooking times by a minute or two for slightly thicker bars in the smaller size pans. If you are doubling the recipe, simply drain the pineapple (saving the juice for this or this or this recipe) and use the full amount of pineapple in the can. If you decide to double the recipe, the bars freeze well and thaw perfectly in less than an hour! The filling in this recipe is naturally gluten-free. While I haven’t tried making the crust with gluten free flour yet, I bet the recipe would work well with your favorite gluten free pie crust, too. What’s your favorite recipe to make with pineapple? Preheat the oven to 350 degrees. Combine the crust ingredients and press the mixture into the bottom of a well-greased or parchment lined 10” square pan. Doubling this recipe will fill a 9x13 pan. I rarely leave comments but my husband and I raved about this dessert when it was done. I made the dessert with blackberries instead of pineapple and it was delicious. Soft and gooey; just perfect. It is my new favorite go-to dessert. I'll try it with other fruits as well. Thanks for a great recipe!!! I'm thrilled that you liked it so much! I love the idea of trying it with blackberries too. Can’t rave enough about these! Simply delicious! I’ve made them at least 6 times since I found this recipe. Best eaten warm and alone right out of the oven! Why the lime? Could there be a substitutefor the lime? Feel free to skip the lime or use lemon instead. 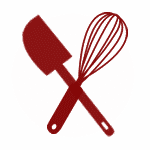 I like the slight tang and balance it adds to the recipe, but it isn't required. Fabulous recipe! I made this for my parents who love coconut and pineapple, and it was a huge hit. I added a splash of white rum to the filling and called them "Pina Colada Bars. "One question -- if making these ahead to serve in a day or two, would you refrigerate after they cool? Thanks! I don't think it would hurt to keep them in the fridge and it might keep them fresh for longer. I'm glad you like them! Simply Delicious!! I don’t usually leave comments but these were so good and easy I wanted to let you know ! I didn’t have lime but used lemon instead and they were so good. I will definitely use other fruits, it will be my go to from now on! Thanks for sharing. The bars have 1 cup of coconut stirred into them. Then they are topped with an additional cup of coconut. There is a total of 2 cups coconut in this recipe. (1 cup is listed for the bars and 1 cup is listed for the topping.) Enjoy! Tidbits is actually a specific size. They are about 1/4 the size of pineapple chunks. You can find pineapple tidbits in the canned food section with the rest of the pineapple selection. I rarely comment on recipes but OMG These were so delicious !! The recipe is a keeper for sure !! Thanks so much !! I'm thrilled that you enjoyed the pineapple coconut bars so much!! I LOVE this recipe. I am soooo excited to try this recipe. The combination of pineapple and coconut is my favorite. Thank you for sharing. I think I may add a few macadamia nuts for a little extra crunch and island feel. I hope that you love these bars as much as we do, Lisa.